The spring of 2009 in Kyrgyzstan is expected to be traditionally active. The authorities urgently announced the date of the presidential elections and the nomination of candidates has been launched in the country. In its turn, the opposition forces are launching the mass protest demonstrations. Are there real conditions for the change of power in the country? Is the presidential chair attractive in the condition of crisis? Ferghana.ru interviewed Edil Baisalov, former executive secretary of Social-democratic party of Kyrgyzstan, on these and other topics. Fergana.ru: What is the point of demanding the resignation of the president today, when the date of the elections was announced? Edil Baisalov: The point is the same: Kurmanbek Bakiev has not proven the expectations of the nation. Not only he did not build straightforward government system, but also he broke the vow, encroaching the power in the country. Four years after March events let us take a look which of the leaders, storming the white house in 2005, have remained with Mr. Bakiev or compare the same rules of demonstrations and meetings, degree of free speech. The hypocrisy and irony of today’s celebration of “people’s revolution” are obvious. The presidential elections, scheduled to July, should not include Mr. Bakiev. The major purpose of opposition demonstrations is to demand fair, transparent and open elections. We need real elections, not their imitation! In any case, Bakiev’s regime is does not have popular and legitimate power. The government wants to strengthen its positions through falsification at the elections as it took place in December of 2007. I would recommend the observers to be more careful in their forecasts and not to make the same mistakes of winter 2005 when the endurance of Akaev’s regime was never challenged. Ferhana.ru: Is it realistically possible to “stir up the people” and lead the opponents of current regime to join the demonstrations throughout the country? Edil Baisalov: The opposition pursues other goals today. First and foremost, they need to get confident again in their own influence and the power of protest events. One should not expect to see the final results on March 27th. This is simply the first event in the series that will be organized in the spring. “Stirring up the people” would be a little bit exaggerated. We are not facing civil war to set such goals. It would be enough to persuade the elite both in the capital city and regions that today’s regime is anti-national and does not protect state interests. Moreover, threatens the life and freedom of everyone who is not favored by Bakiev’s family. The clan offers the Kokhand state system of unlimited absolutism. The latest events evidently convinced those public onion makers that were still hesitating. Ferghana.ru: Do you mean the number of criminal acts, initiation of non-political criminal cases against opposition leaders? Does it have a link to upcoming elections? Edil Baisalov: Yes, of course! Mr. Jekshenkulov is arrested, Mr. Isakov is on remand. Few other leaders are counteracted while the mechanisms included the forced appointment to positions in the government. The provocations against Omurbek Tekebaev are still continued. The opposition newspapers have been shut down. Azattyk radio (Liberty Radio Kyrgyz service) is also shut down. Election code and the Law on non-governmental organizations are amended. The journalists are assailed. The number of political prisoners is growing. Ferghana.ru: What is the reason of Medet Sadyrkulov’s death? Was he really linked with the opposition forces or he could play against the central power? Edil Baisalov: Everyone, more or less aware of Kyrgyz politics rules, knows that nearly all current and former officials try to support at least stable connections with opposition forces and even friendly relations. First, our country is small and the ruling elite are even smaller. Secondly, the events of 2005 are fresh in mind when it took few hours overthrow the government. It is not worth paying attention to the fact that Mr. Sadyrkulov was saying about his disappointment in Bakiev. It is possible that he was the source of the threat since he was aware of state secrets. But there are dozens of such people. The scariest thing in this story is that Mr. Sadyrkulov became the victim of irrational, absolutely unjustified and openly dangerous revenge. It was the revenge of the person who could not forgive Mr. Sadyrkulov that he became the alternative influential center for the President. The ruling elite learn the lesson – everyone, turning against this power, will be eliminated. Undoubtedly, Sadyrkulov was talented administrator. The murder of Sadyrkulov is evidence that some forces try to terrorize the country. However, I will repeat that this produced adverse effect: the essential defense reaction will soon overthrow the current regime. Ferghana.ru: Which politician has real chance to replace Bakiev this summer? Edil Baisalov: We are not talking about the replacement of Bakiev by someone else. I mean the change of the nature of our country. First of all, the constitution of 1993 should be reestablished and new elections should be held in all accordance with it. All the decisions of illegitimate parliament of 2007 should be cancelled out. New judicial power should be formed. The experience of March 24 demonstrates that we should not stop at unfinished solutions. The attempt to satisfy certain circles and reach compromise between ruling clans at the expense of people’s interests will not be effective. The special committee, popularly trusted and highly respected, will carefully investigate all the illegal and anti-constitutional actions of Bakiev’s government. I am not speaking about repressions, but it is necessary to make sure these people do not participate in the political life for three-five years. The entire action plan needs not the charismatic leader, but the agreement between democratic political forces and their decisive and united mood. Ferghana.ru: Is Almaz Atambaev, formerly respected and popular leader, will run in the elections? Why do we hear nothing about him? Why does Felix Kulov, irreconcilable before, keep silence? Edil Baisalov: Most probably, this is the case when they will prefer to observe the elections from the bench. Both served as Prime-Ministers in Bakiev’ team. Due to fallacious ethics of our officialdom and low rating of Bakiev’s team that negatively impacted their own reputation, it will be difficult for them to challenge the former boss. Nonetheless, both leaders will play significant role in post-Bakiev reformation of the country. Ferghana.ru: Are opposition forces able to nominate single candidate? Who can become the one? Edil Baisalov: The names of possible candidates are well known. It is essential for them to nominate single candidate. They have many worthy and popular leaders. In the most challenging times, Bakiev always played regional games, threatening the national solidarity of our republic. The same will happen again. The executive political leaders understand that. From this point of view, I would name three main candidates: the leader of SDPK parliamentary party Bakyt Beshimov, the General Ismail Iskakov and Ata Meken party leader Omurbek Tekebaev. I do not believe we need to select the single candidate in the first week of presidential rally. On contrary, all three of them should announce their participation and launch dynamic pre-election campaign. People will vote not for the opposition, but against Bakiev. However, if they want to generate public interest and inspire the electorate to vote for them it will not be enough just to run anti-Bakiev campaign. Main events will take place in the capital city and they should take it into consideration. Ferghana.ru: Is the presidential chair enviable position today in the condition of crisis? Edil Baisalov: Considering the work, to be carried out by new President, this position is temporary by definition. The mission of the next President is to clean up the political mess, reestablish government institutes, set new rules of the game and leave. He will either work to make history or to generate resource for the next elections and get rid of competitors. Therefore, the second term is impossible. Note. Edil Baisalov was born in 1977. He finished high school in Naryn and participated in the exchange programs in Turkey and USA. He graduated from American University in Central Asia (Business Administration) and Kyrgyz State University, named after Jusup Balasagyn (Political science). 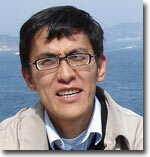 Mr. Baisalov is well-known in Kyrgyzstan as public figure and human rights activist. In July of 2006 he received the award of American lawyers association “For outstanding efforts in the promotion of rule of law”. Becoming the member of social-democratic party of Kyrgyzstan, he was elected as executive secretary. In 2007, following the scandal with the ballot paper, the criminal case was initiated against Baisalov. He escaped Kyrgyzstan with the family. Today, he continues his education in Uppsala, Sweden.